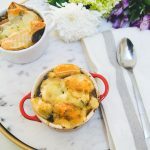 A modern-ish twist on a French classic, this completely vegetarian recipe can be made in a crockpot. Traditionally, French Onion Soup should have a slice of baguette with Gruyere Cheese melted over it, but I used my homemade sourdough bread instead. To make it vegan-friendly, substitute the cheese with soy cheese. If you’d like to make this in a crockpot, just toss all the ingredients together & cook on high for 1-2 hours. Reduce the heat to low & cook overnight. Ladle the soup into ramekins & bake as per instructions. 1. Preheat your oven to 375º F. Add EVOO in a Dutch oven on medium heat until hot. Lightly caramelize the onions with a pinch of salt & the sugar, stirring occasionally for 3-5 minutes. 2. Add ghee, garlic, mushrooms, herbs, & Worcestershire sauce. Stir for about 5 minutes. Add wine & allow soup to come to a boil. 3. Slice bread proportionately to the size of your ramekins. Butter the bread & set aside. 4. Return to the Dutch oven & add water & vegetable base. Mix well & bring to a boil. 5. Bring your soup to a simmer by reducing the heat to low. Add salt & pepper to taste. Cover your Dutch oven & cook on low for about 1-2 hours. 6. Place your ramekins on a large baking sheet. Ladle your soup in the ramekins, leaving enough room for the bread. Add slices of cheese on top to cover ramekin completely. Sprinkle a little salt & pepper on each ramekin. 7. 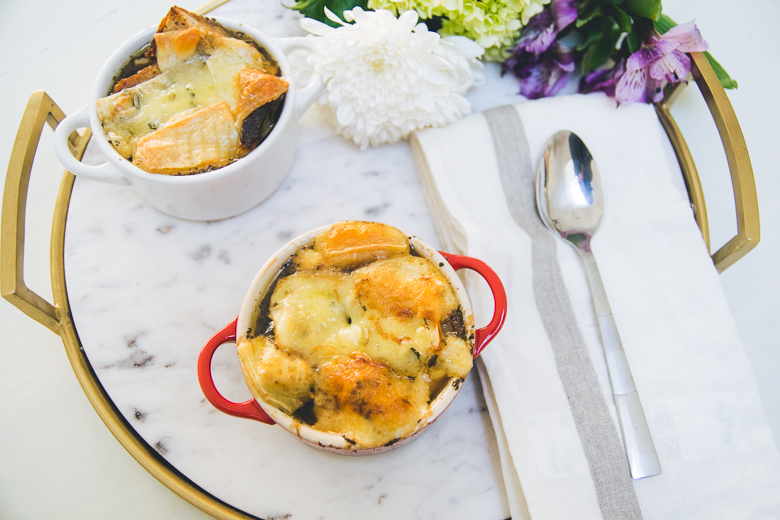 Load the ramekins into the oven & bake for 20 minutes until cheese has melted. 8. Sprinkle the parsley on top of the soup & serve. You can use vegetable stock instead of the concentrated base. You can also use Vegemite or Marmite since they're concentrated yeast! I never include nutritional information on the food I make since so many ingredients go into them that it’d take a while to actually sum up everything. Also, because I’ve added the optional vegetables to toss in, it’s difficult to calculate accurate nutritional value. I also don’t want to promote an obsession with calorie counting because you could consume a diet of less than 2,000 calories & still be unhealthy because you’re not eating a balanced nor nutritious diet.